We managed to get out of the Portland area for the first time in a couple months and planned to steal away for a few days into the North Cascades. Leaving Portland around 7PM on Friday we drove North through Seattle then East through Darrington and Marblemount, stopping only once for gas, until we tiredly arrived at the Blue Lake Trailhead at 1:15AM. We reclined the car seats and shut our eyes for a few hours, rudely awakened at 5:20AM by our cell phone’s alarm clock. Our objective was to climb Liberty Crack on Liberty Bell Mountain – we fought the urge to go back to sleep and started moving around. I wolfed down a hunk of french bread and brie cheese, made some final gear organizations, then drove down the road a mile to the side of the highway where the hike in begins. From the pond next to the highway, we picked up the trail and continued steeply up into the forest. Though steep, the trail is mercifully short and probably didn’t take more than an hour or so to get up to the base of the climb. Unfortunately, we had been beaten to the start of the route by a team of two who looked to just be starting up – D’oh! We watched the party above us solo up to the base of first pitch. We decided to rope up and it was a very good idea as there was definitely at least 1 5th class move there. Joanne led up and hang out at the base of first pitch for quite some time before the first party got off the pitch. 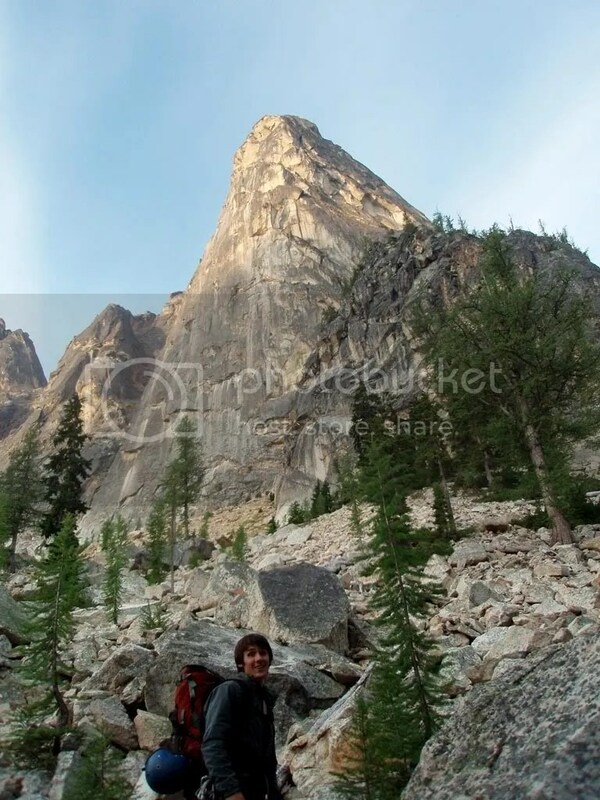 Emerging from the trees on the hike in, you’re rewarded with a great view of the East Face of Liberty Bell Mountain. Liberty Crack shoots straight up, somewhere around the left skyline. Talus-hopping along the base of route. By this point we realized we’d been beaten to the start of the route! With somewhere around 1000 feet of technical climbing, including several sections of aid, we were unsure if we’d be able to finish in a day. 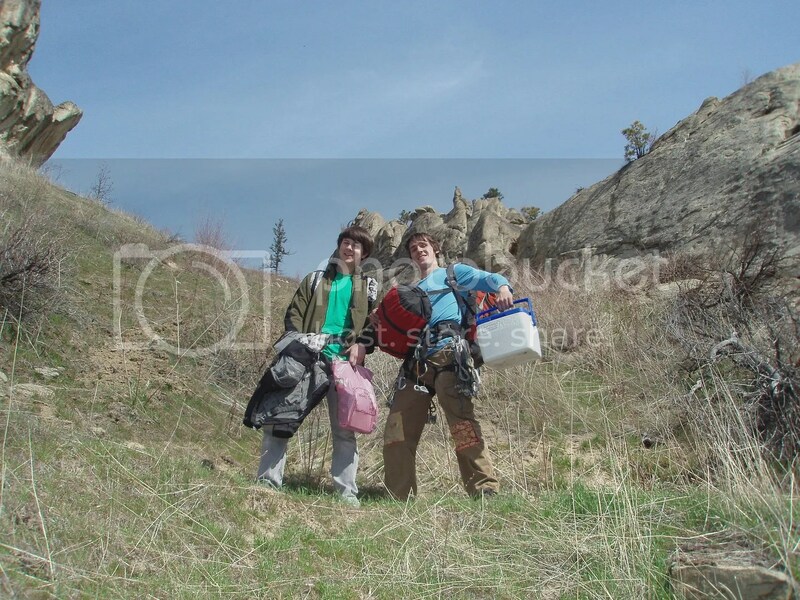 So we packed fairly heavily, with a couple jackets, one sleeping bag, and one bivy sack. Basically enough to ensure that an unexpected night on the mountain wouldn’t be cozy, but at least not completely miserable. 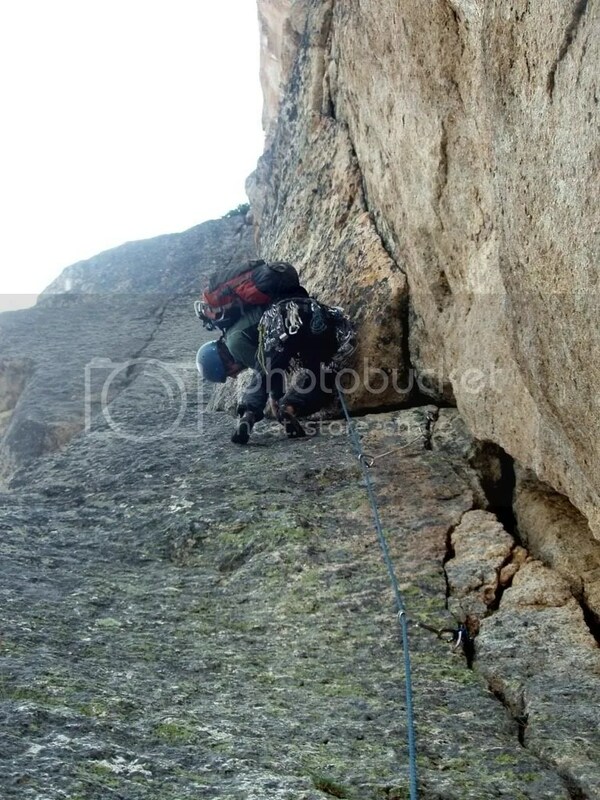 Of course, climbing technical terrain with that extra weight is a bit of a pain in the bit, which became pretty obvious on the first pitch. I had planned to free climb this but with a pack on, it quickly became obvious that this wasn’t happening so I just pulled on anything to get up it. Joanne joined me and she got to lead the next pitch, which is likely the most memorable part of the climb, the Lithuanian Lip. I’m 1/4 Lithuanian so maybe I was born to climb this…but it was Joanne’s turn to lead. With fixed gear all the way to the lip, the aid climbing here is really straight-forward and she shot right up it. The trickiest part looks to be placing a piece above the roof and then awkwardly backstepping in the twisting etriers to pull yourself up over the lip. Joanne working up and over the lip. This is a pretty unique pitch as you’re just dangling under the roof. Also fun to clean this pitch! The third pitch is supposedly the “crux” of the aid climbing (A2) but once again, with all fixed gear on the thin sections, this pitch is pretty easy. It’s worth noting that the fixed gear here is in pretty sorry shape, an assortment of bashies with mangled wire cables that look ready to fail at any time. I think if I did it again, I’d let Joanne lead this one (she weighs less than me!). 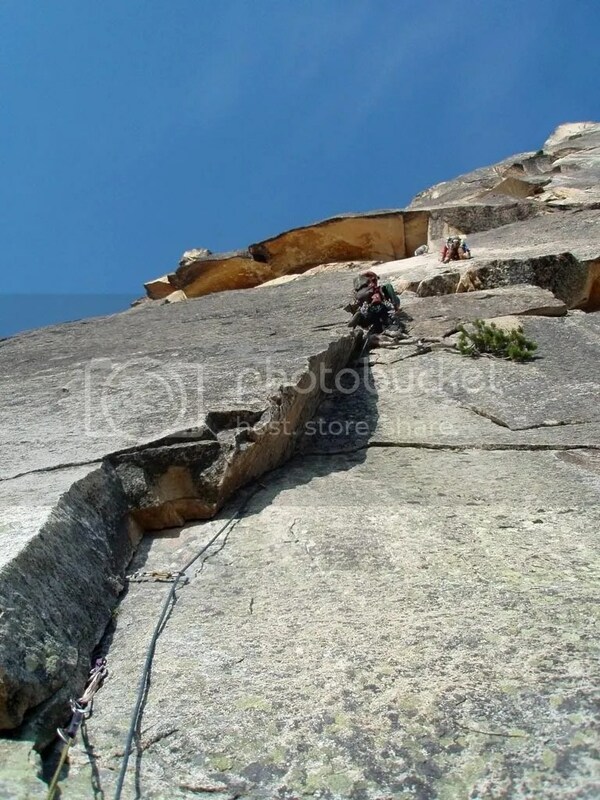 The 3rd pitch. Looked real thin and probably really scary to try to free, on the existing fixed gear. At this point, the guys in front of us pointed out that we were moving faster than them and graciously let us pass at the end of pitch 4. It was nice to be in front (as another party had come up behind us) so we switched on the turbo jets, climbing and swinging lead like maniac! We never saw any of the parties below us again. 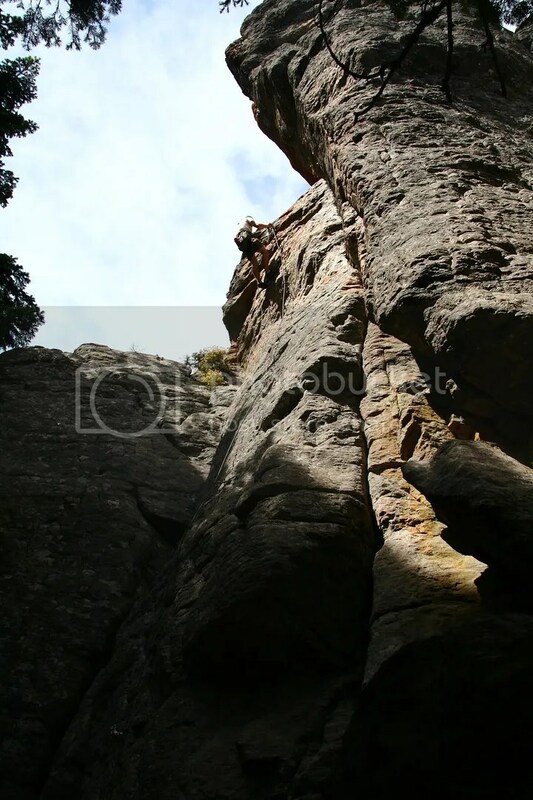 From the end of pitch 3 you can put away the etriers and turn into free climbing mode. 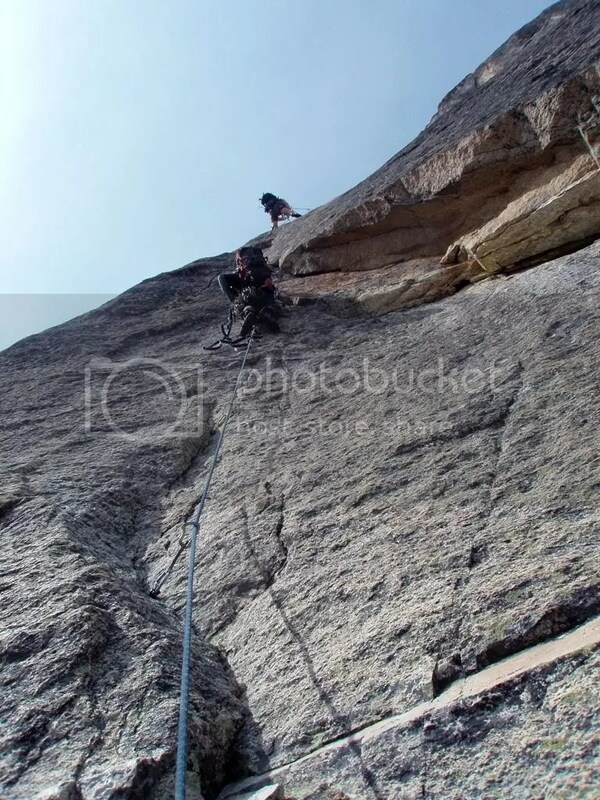 The climbing stays steep and interesting, with all pitches clocking in at 5.8 or harder (until the last pitch or two). In particular, we liked pitches 4, 5, and 7. 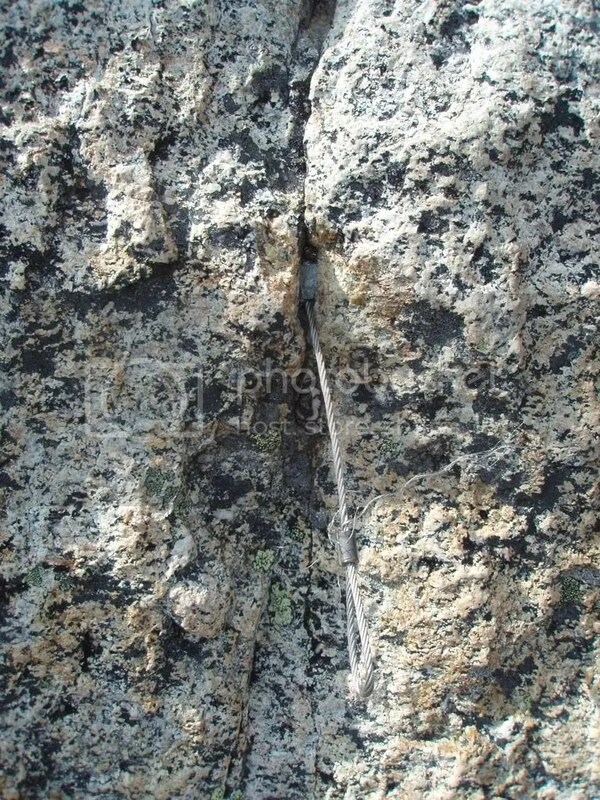 Pitch 4 is a cool splitter crack that goes free at around 5.9+. Pitch 5 is a fantastic sustained 5.8+ dihedral. And pitch 7 throws some interesting slab moves at you. 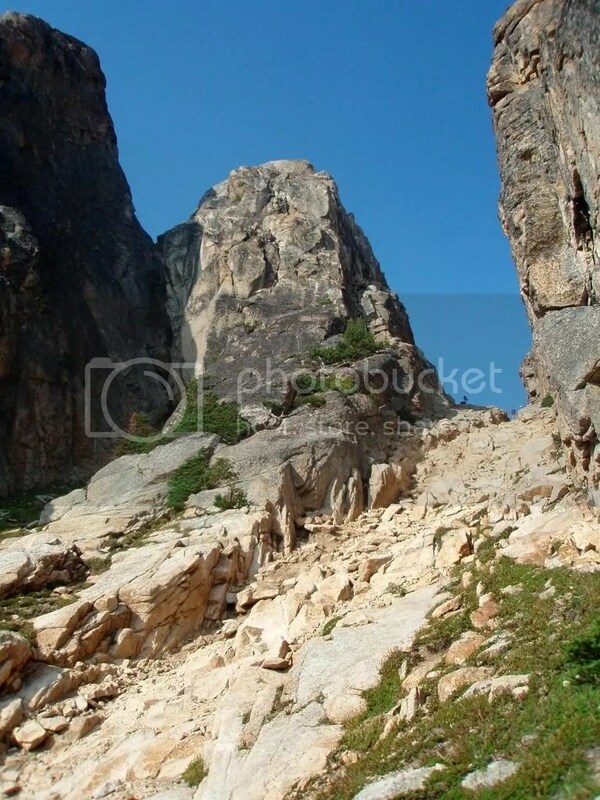 For a long alpine route, there were very few bad pitches (though the “Rotten Block” on pitch 6 is definitely scary – what is holding that thing onto the mountain!?!?). 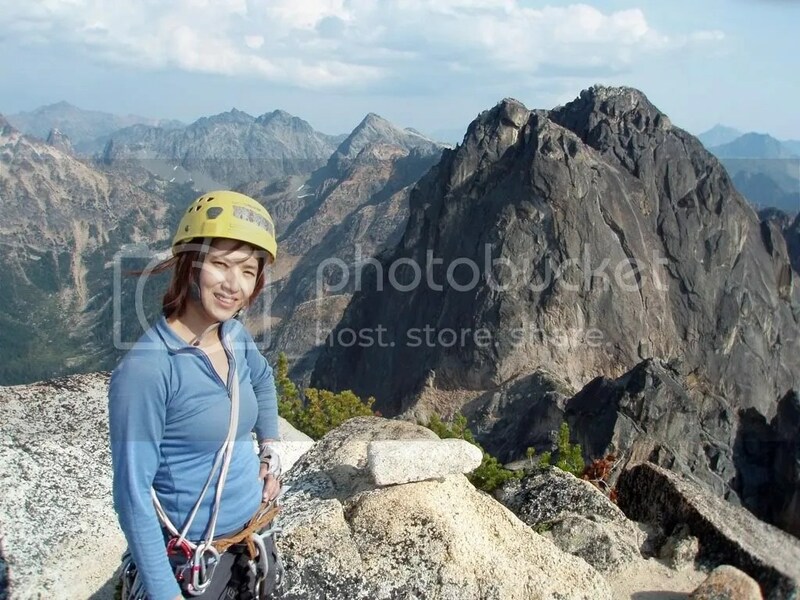 By the time we reached the rappel station, there were already lines formed from the Becky Route so since we have to wait anyway, we decided to unroped and solo onto the summit. 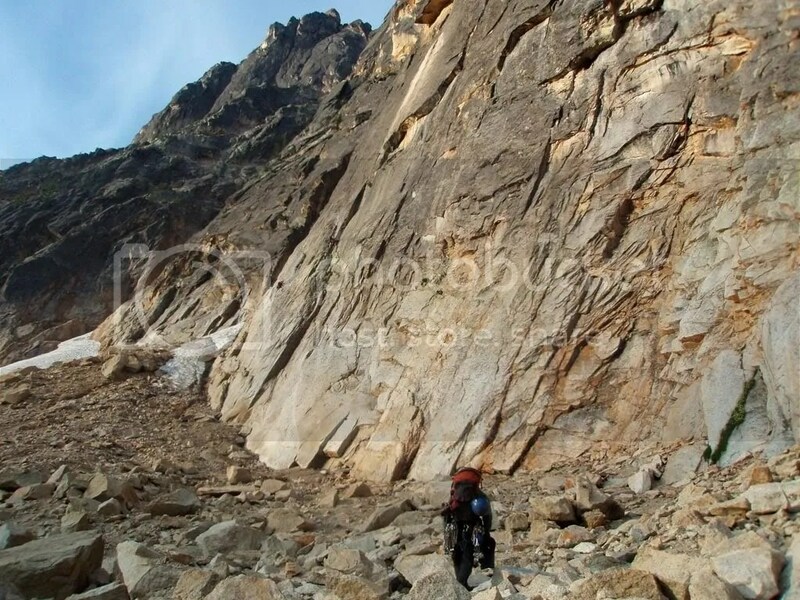 The final summit pitch is easy with a crux friction slab section which is a little tricky to down climb. Less confident climber should definitely get belayed for this section. All in all, not counting the time we were waiting behind the other team, we climbed the route, base to summit, in 7-8 hours, which was waaaay faster than we expected. 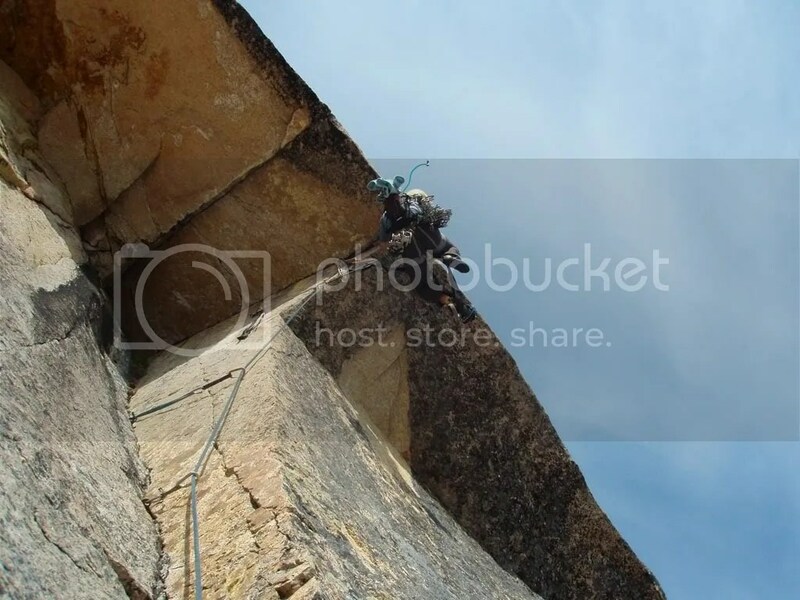 For teams that are competent on 5.10 terrain with some aid climbing experience, we’d make the following recommendations: fire the climb in a day (don’t bother fixing the aid pitches), get an early start to get in front of other parties, and bring a relatively light rack (1 set of stoppers w/ micronuts, 1 set of cams from the smallest TCUs to a #3 or #4 camelot, doubles in the 0.75, 1, and 2 sizes). Also consider linking the two pitches above the Lithuanian Lip (the A2 pitch and the 5.9+ splitter). The obligatory summit shot with fantastic views of the surrounding spires and more distant peaks. Looking back at the descent gully and Liberty Bell from a different angle. The gully was fairly ugly to descend, though not as bad as the horror stories I had heard. We haven’t been making any long road trips, staying local most weekend. 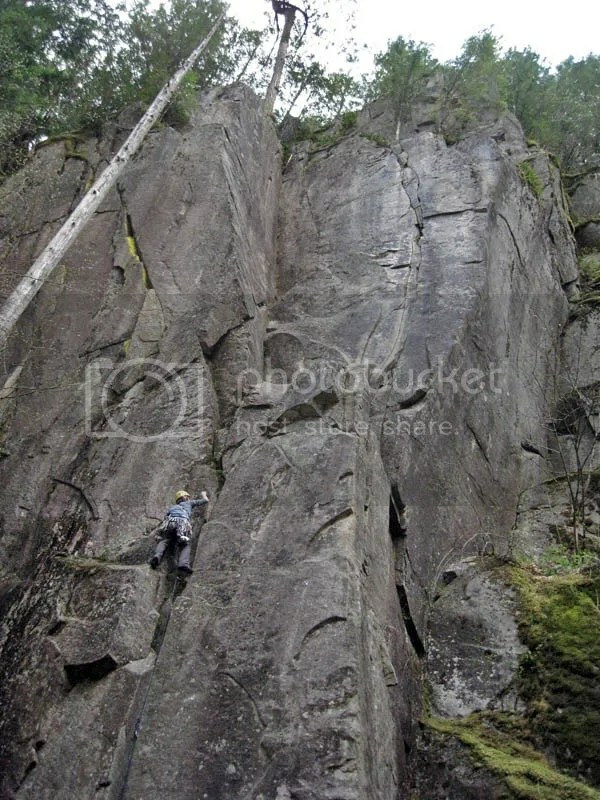 Last weekend, we were checking out the local crags near Mt Hood. Here are a few pics from our trip, I’ll try to add more when I get more time. Why do people need to be yelled at to get things going? I need your ID number and your name. Also, by the way, you are being recorded (I didn’t have a recorder, pure threat). I will use this as evident when I sue you guys for destroying my sprinkler and not fix it. Well, the guy who I talked to did response finally. They came and fix the sprinkler the very same day. Ahhh…. the power of threats :)…. Yogi hurt his leg. I don’t know how it happened but lately he’s been whimpering a lot and he doesn’t jump onto the couch or bed as he usually does. We took him to the vet but his fear of the vet caused so much adrenaline such that his leg pain does not show. 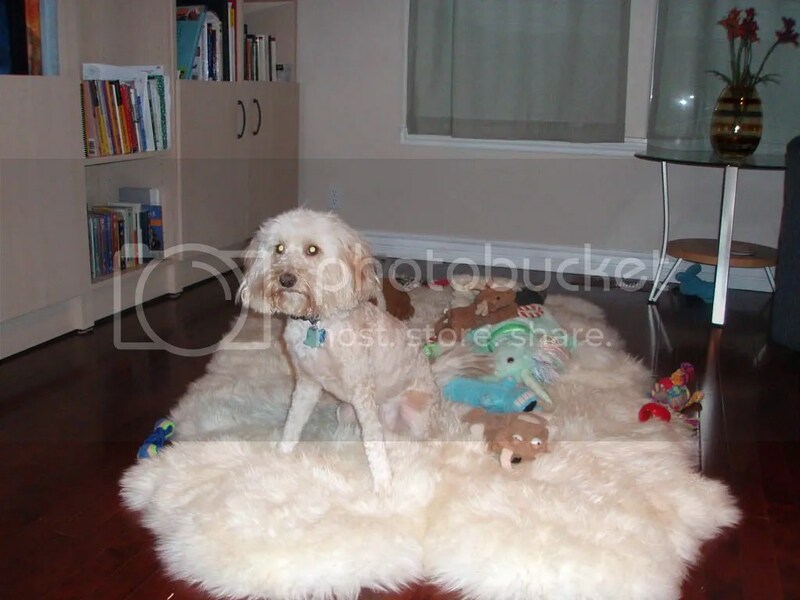 At home, when I try to touch his leg he would shake with fear and whimper. At the vet office, the vet bend his knee, touch it, shave it, and Yogi showed no sign of pain. So now he’s on doggie aspirin and we’ll see how his leg doing in the next few days. 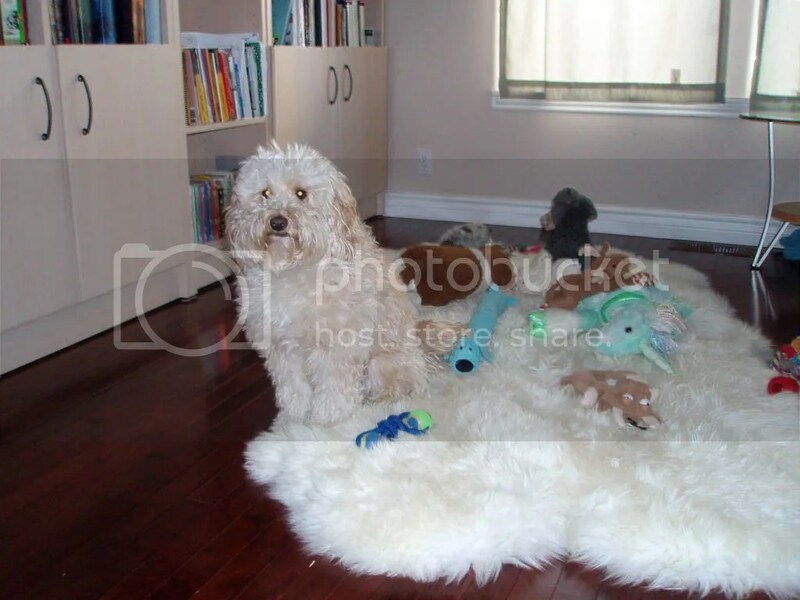 My poor pooch…. We have been really lazy in posting updates on this blog. It’s not like we haven’t been doing anything, it’s just that we are so lazy. Anyway, here are some old news, things that happened since the last post. First thing first, my mum finally went home. She spent almost 6 months in US with us. I’ve gotten so used to her being around, making me breakfast, lunch, dinner and keeping things tidy. It’s going to take a while to adjust being just 2 of us again. She made it home to Malaysia safely even though sounded like it was a big adventure because she never travel alone before. Zach visited us a few weeks before and we took both him and my mum to Leavenworth, Washington. 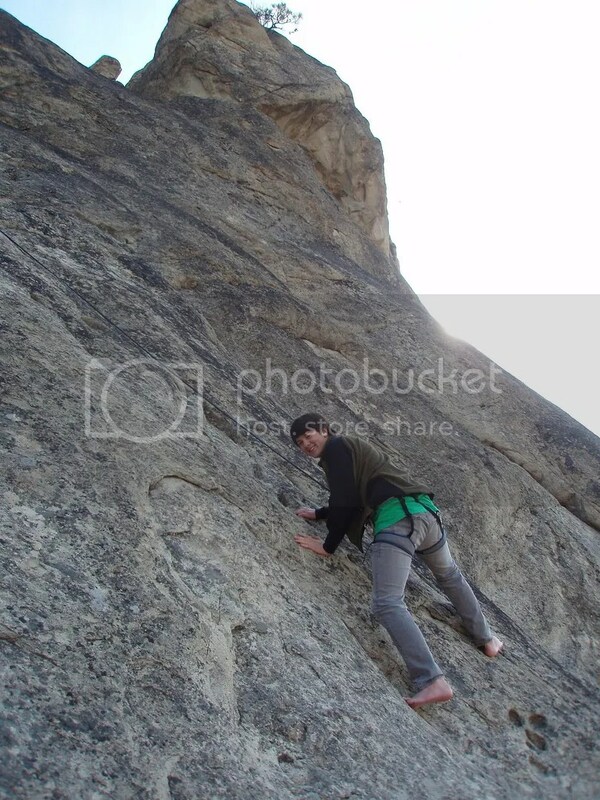 Here is Zach climbing in bare feet. And since we were in a Bavarian town, we got to have some pig feet. And Yogi of course get a taste of it too. 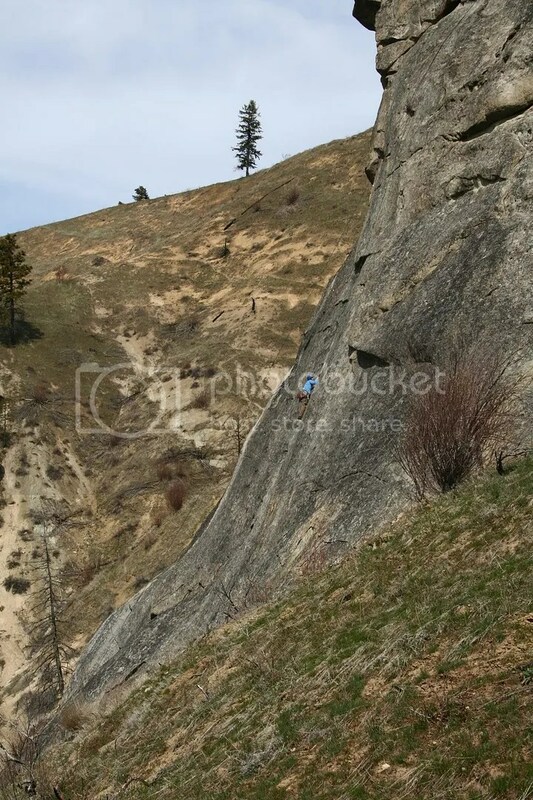 Here is Matt climbing some crazy slab route. Last weekend we went to Index. We heard so much good thing about it so we figure we might as well check it out before the close the access to the Lower Town wall. The routes are all great and fun. Camping is pretty horrible because we literally sleep next to the train track and the train goes by at least 8 times the whole night. Thanks to Eric, we have a few good pics of Toxic Shock. We mostly we just climb and not take any pics at all. 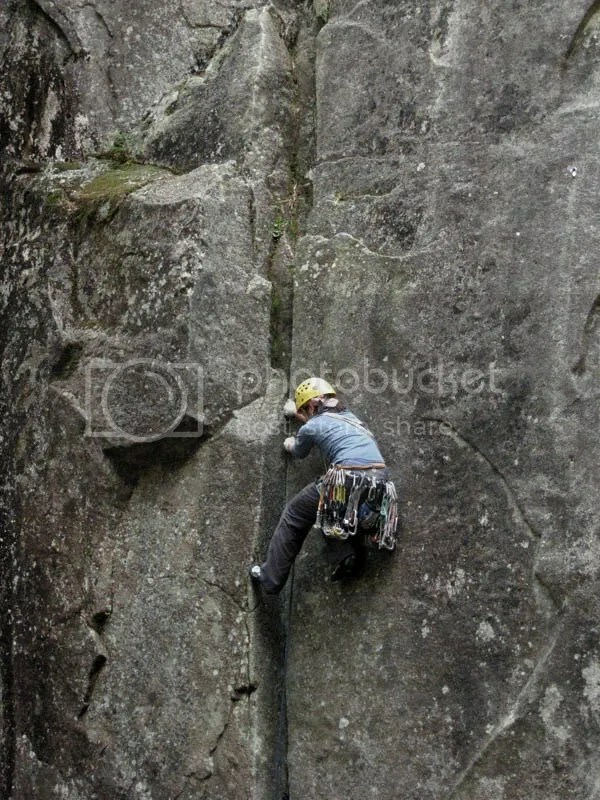 This is me braving through the crux, resisting the urge to pull on my purple camelot. I was so glad when I got to the thank god hold. 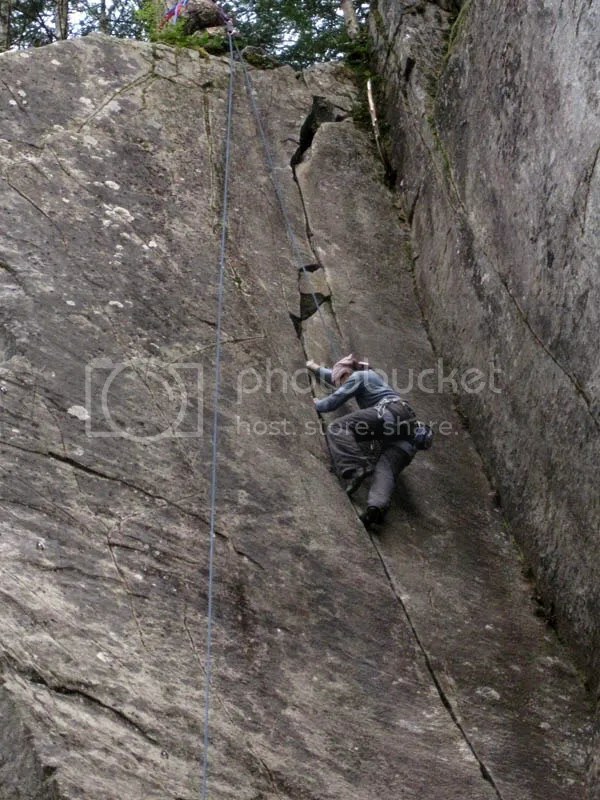 This is me top-roping after I bailed before the cross-over to the splitter, my mental crux. The move is pretty easy on top-rope but the fall factor is too great for me to risk. So over the last years, birds have slowly found their way into our attic. Before our trip I remember hearing animals up there from time to time but it was never that big of a deal. Well, recently, it’s become a big deal. It sounds like there’s an entire flock up there, squeaking away. And I can hear some of them pecking away at the wood. Grrrr…that was the last straw. 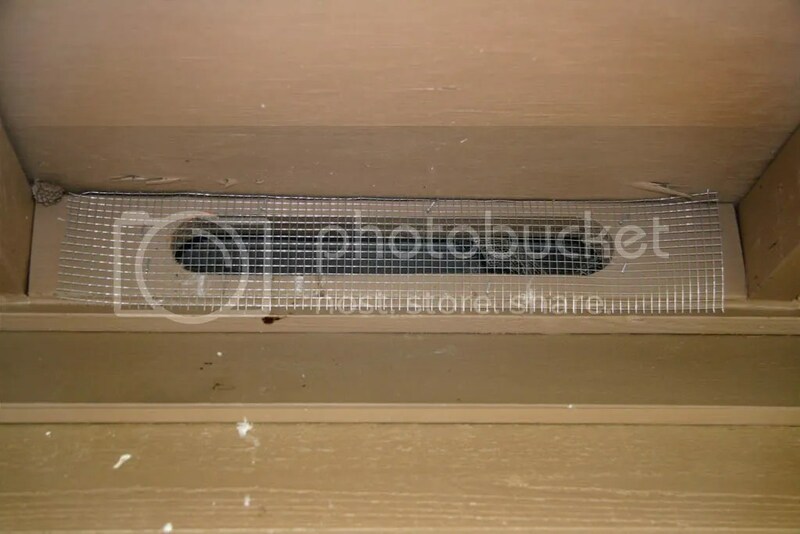 We have more than a dozen of these vents along the roof of our house. 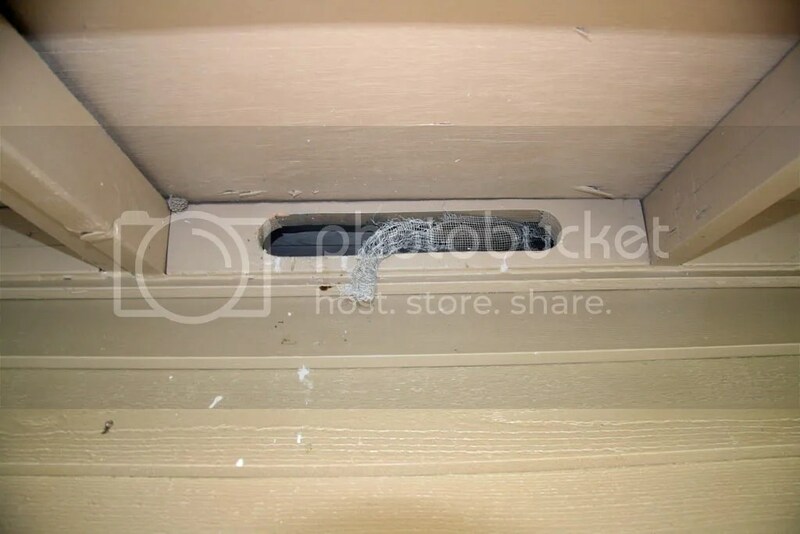 Upon closer inspection, I could see about 2/3 of them had holes in them, giving birds easy access. Judging by the poop streaks on the side of the house and the insulation on the ground, they were enjoying their new home. Now I wanted to serve these birds with an eviction notice immediately but these vents are 20 feet off the ground so I needed a ladder. I’ll keep this short: Amazon had the best pricing by $100 but my ladder got back ordered. 6 weeks after ordering, I finally received the ladder (today). But they sent me the wrong ladder (way too short). 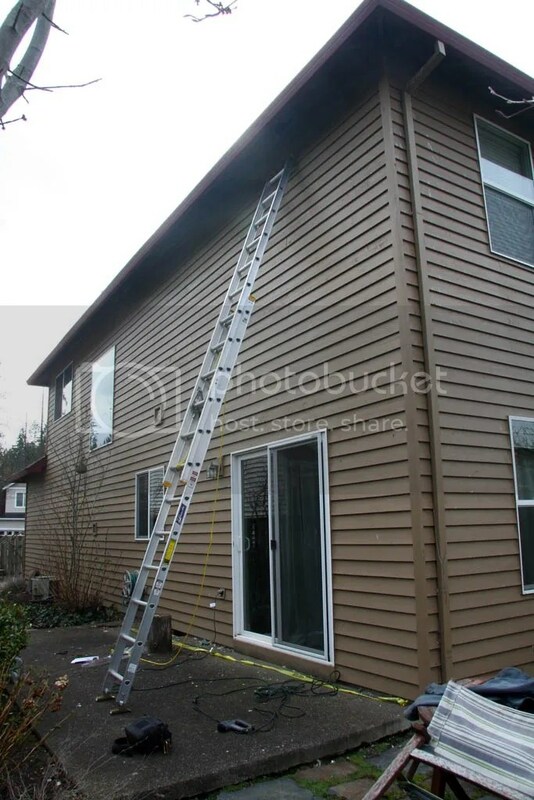 Apparently, some other guy in Hillsboro had ordered a ladder and they had got them mixed up. They were clever enough to figure it out and came two hours later to give me the right ladder. Fortunately, the birds haven’t had any babies yet so I don’t feel too bad about kicking them out. This ladder will take me anywhere…if I can work up the nerve to get on it. I’ve never been on a tall ladder before and maybe this is normal but this one is not particularly stable. I donned my climbing helmet, grabbed the staple gun (and camera) and slowly climbed up, the ladder trembling beneath my feet. 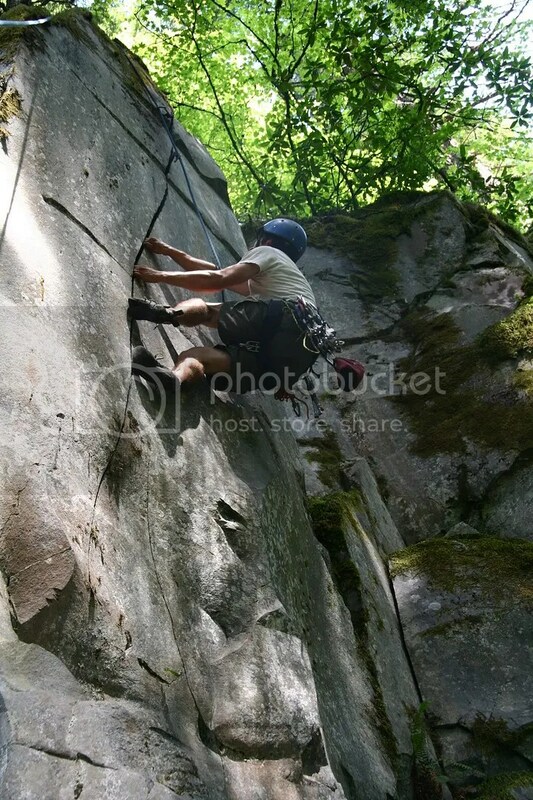 The thought passed though my head that I’d feel more comfortable rock climbing without a rope. Well, somehow I managed to get up under the roof. I awkwardly snapped a picture and then sealed up the vent. Alright, just 9 more vents to go! Here’s the finished job. It’s not really perfect but it should slow the birds down: it just needs to last until we sell this house. The weather has continued to be a bit strange this year – colder than usual with very little rain. It’s nice to have a winter without the constant rain we usually get but it would also be nice to have a little more snow up in the mountains! Meanwhile, we’re starting to get excited about Spring – looking forward to the longer days and more reasonable climbing conditions! Here’s a couple (two) pictures from the last month(!). 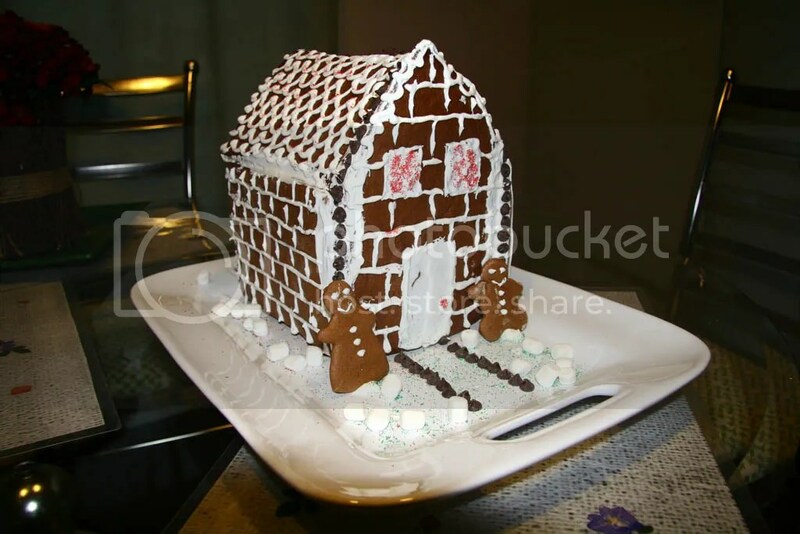 I think gingerbread houses are more of a Christmas thing but we made ours at the end of January! This might be proof that we are going crazy inside the house. 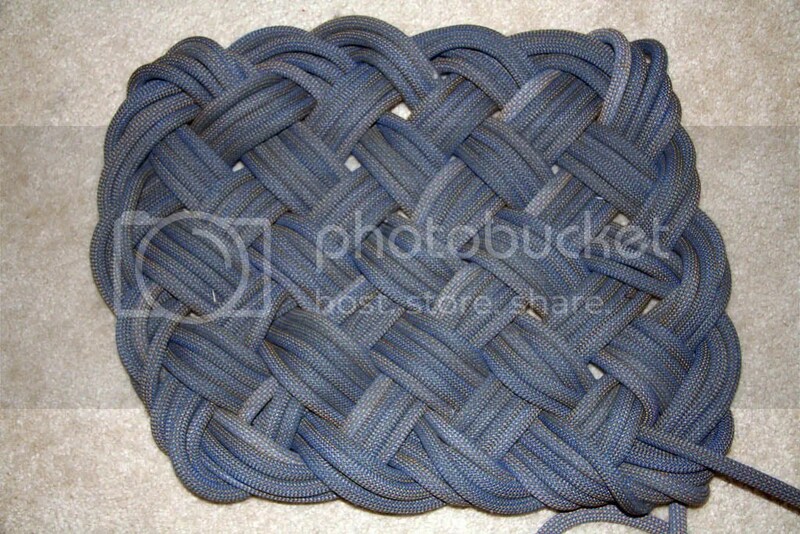 Joanne took the time to transform one of our old climbing ropes into this welcome mat. She got the idea off of the internet – I thought it looks pretty neat and it’s turned an old rope into a work of art! OK, so after we took Yogi with us to go skiing a few times, his shaggy hair started developing the craziest mats I’ve ever seen. They were getting to the point where it was impossible to comb them out so we had to take him to get a haircut. He always looks incredibly strange after a haircut but this time they cut him really short. We both agree that he looks like one of those hairless cats so every time I see him now I go “Meoooow”. Anyway, here’s the before and after shots! I have to admit I’m a little embarrassed walking him around the neighborhood looking like this. 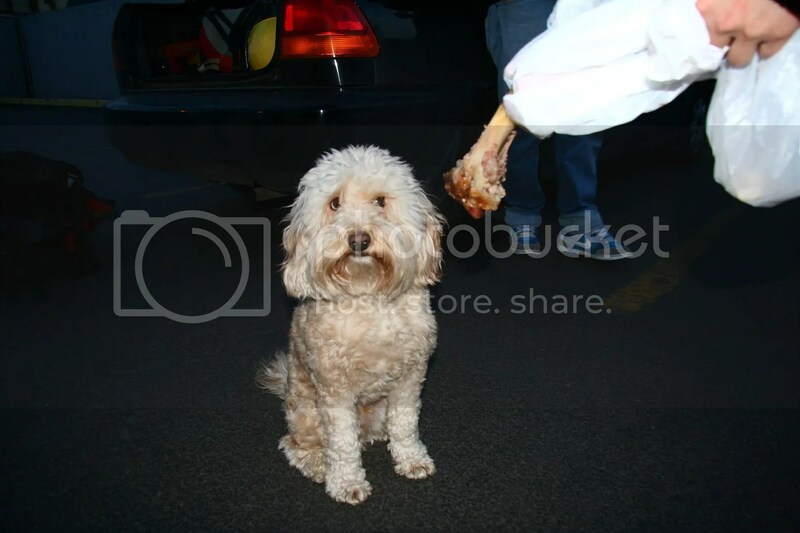 Maybe we’ll just take him out for a walk at night…Poor dog! So when we went to Malaysia in September, we left a bunch of our climbing gear in Michigan. Somehow, though, this gear never made it back to Oregon and my Mom can’t find it in Michigan. What’s missing in action? 14 cams (including the BIG ones *sob sob*), 30-40 carabiners, 1 pair of down booties, 1 sleeping bag, 1 down jacket. The cams alone would cost $600-700 to replace. It would be nice to have some idea what happened to all this stuff but it would appear some kind of evil gnomes may have made off with it.